If you find bruising affecting bunched broccoli or broccoli crowns don’t look to the USDA Inspection Service to answer your questions. While being a trainer at the USDA’s Training and Development Center for years, it was obvious to me and the entire training staff that the inspectors were all over the board on whether to score this as a defect or to ignore it. From the USDA inspectors that flat out refused to score bruising on broccoli as defect they would say, “The bruising is due to the broccoli being packed; there is nothing that can be done to prevent it.” That sounds logical, and makes sense. Although the USDA has never attempted to clarify this issue, the USDA’s own Inspection Instructions for Broccoli devote two “entire” sentences to this defect stating, “Bruising may result from a very tight pack, excessive pack ice or rough handling. Score as damage when serious enough to materially affect the appearance of the bunch, as serious damage when seriously detracts from the appearance of the bunch.” As you can see, the USDA’s Inspection Instructions do not state to ignore this defect. 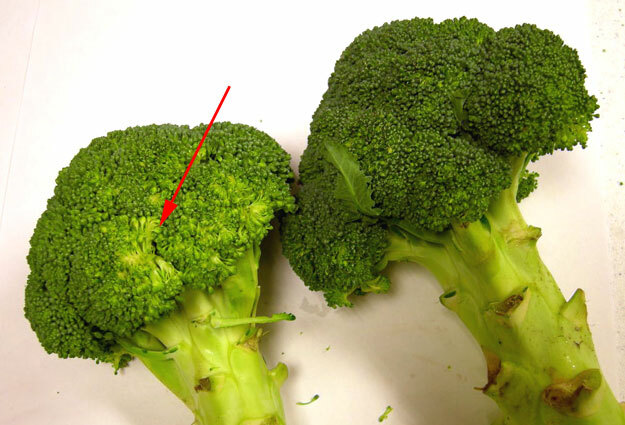 So, it is a defect, and if you feel the bruising materially affects the appearance, meaning a consumer may not purchase the bunch, then you should score bruising on broccoli as a defect. You would be allowed up to 10% of the bunches with damage by bruising. And lastly, the USDA has not developed any visual aids depicting when bruising is scored as a defect. In the absence of any official visual aids, I suggest you use the above image as your guideline. I would score this bunch as a defect, because the one stalk on the left is bruised. If the bruising was not as bad as shown above, only slightly bruised, then ignore the bruising and do not score it as a defect. bruising is not free from? we’d have to disregard 10% of it per crown before we could score?